EU lost to China 0-5. The broadcasting schedule for December 10 will feature the game between Hei Jia-jia and Li He — “the ‘game of the two beauties,’ as they say here in China,” says Hsiang. 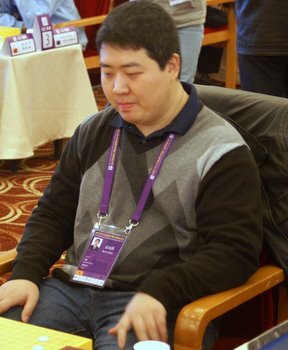 Tentatively, Andy Liu will be featured on the 14th when he plays against Xie He from China. Click here for James Davies’ more detailed reports on Ranka Online, where you can also follow live matches, check out the schedule, results and participants. In other news, Hsiang reports that “the International Go Federation (IGF) held a special Board Meeting today (12/9). I invited (AGA Board member) Andy Okun (in dark blue shirt in photo below) as an observer. Many things were discussed, including an IGF proposal that will fund two projects in the Americas: the AGA’s plan for an international go symposium and the Iberoamerican Go Federation’s plan to start a pilot project teaching go in Venezuela schools. This proposal now moves forward to IMSA.” The AGA’s plan to establish a pro system was met with great enthusiasm and encouragement, Hsiang reports. The IGF is starting to plan the next round of the SportAccord World Mind Games that will now be featured for at least five years. Hsiang and Yuki Shigeno will again represent the IGF in negotiations with SportAccord. Brunei will be next IGF member, with Kazistan likely to follow. The Ing Foundation will apply to become a new Association Member of IGF; its president, Mr. Ying Ming-haw, has been invited to become an at-large Director of the IGF. 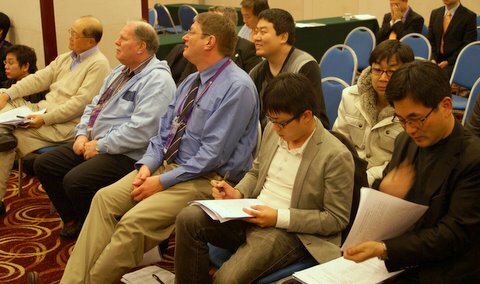 WAGC 2012 will be held in Guangzhou, May 11-18, and the 2012 WAGC 2013 will be held in Japan, with site selection and date to be announced in May 2012. There is still no site contract for World Mind Sports Games II in 2012 and the event is unlikely to take place. photos: US team player Jie Li (top right); team captains (bottom left); photos courtesy Ranka Online.